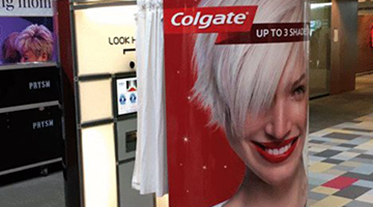 The campaign was to provide eye catching, fully branded photos booths with branded instant prints for Colgate at 5 of their largest customers head offices and encourage clients to use the booth whilst distributing product samples. The photo booth was required to use green screen and each of the 4 images needed to have a different background making the images stand out and inject fun and interaction into the activity. Colgate had just developed and brought to market “Total Proof” tooth paste. Our brief was to provide a photo booth with instant prints utilise green screen technology to brand representatives at the following head offices: Asda, Boots, Superdrug, Tesco and Morrisons. With each print we were tasked with giving away free samples of Total Proof whilst informing the clients of the new developments and benefits of the tooth paste. The branded photo booth and branded prints were a huge hit with the employees creating a buzz of excitement and thousands of samples of Total Proof toothpaste were distributed with thousands of prints.